Jussi bought me yarn. Oh boy. 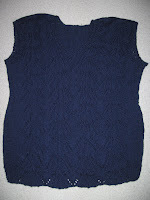 I've been knitting a blue slipover for my Mom.. Not much to go! About 95% done. Then, I can concentrate on my own pattern called April Sleeves... Let's see if I can finish it before May..!